During July 2011 there was an exhibition of Ruth Ander's beautiful monoprints upstairs at the Brean Cove Cafe. This room has wonderful views and was a splendid setting for Ruth's evocative images. The exhibition was of seascapes and distant landfalls of the Bristol Channel, in all its moods, as seen from Brean Down. A mono-print means that a single image is pulled from glass surface that has been inked to gain a particular effect. The artist is really painting the image onto the glass and then 'printing' this onto a sheet of paper. Sometimes a print is the result of several inkings. The technique is capable of great subtlety. 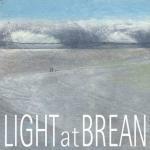 Ruth's work captures the plays of light and shade, glistening water and dark, rolling clouds of the Bristol Channel. Find out more about Ruth Ander's work by going to her website. 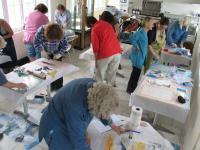 Ruth also ran a highly successful monoprint workshop during the exhibition period when participants could learn the art and craft of making monoprints. You can also download a Pocket Panorama – a PDF to download, print, cut-out and keep (the fold lines are in the top panel) and take with you to Brean Down – or put it on your phone. Link in the lefthand column.